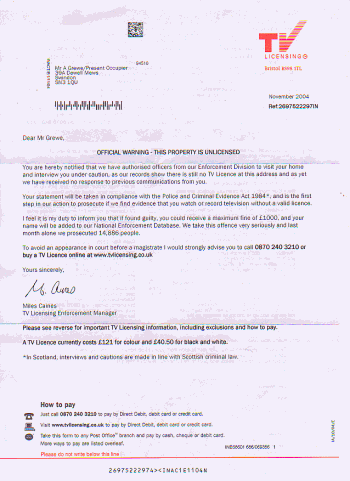 Now that they somehow managed to find out my name my good old friends from TV Licensing have sent me another letter. And they are getting serious now. Or at least try to. OFFICIAL WARNING - THIS PROPERTY IS UNLICENSED Aha. Is that dangerous? Or why do I get an official warning? Should I be worried? AND WHY ARE YOU SHOUTING? Your statement will be taken in compliance with the Police and Criminal Evidence Act 1984 I'm impressed, does that mean I "have the right to remain silent" and all that or did I watch too many bad movies when I was younger? and is the first step in our action to prosecute whoops? Prosecute? That sounds serious! if we find evidence that you watch or record television without a valid licence. Ah, slight problem here: I do neither. So no prosecution. What now? I feel it is my duty to inform you that if found guilty, I feel it is my duty to inform you that this is a very big if, you could receive a maximum fine of £1000, you could be forced to write a very humble apology for sending me all these threatening letters wrongfully accusing me of licence evasion and your name will be added to our National Enforcement Database and you could be forced to remove my name from your database as I have my doubts that it should be there under the Data Protection Act. To avoid an appearance in court before a magistrate I would strongly advise you to call 0870 240 3210 or buy a TV Licence online at www.tvlicensing.co.uk Hm, that's assuming I do need one. I thought we had established by now that I don't have a TV (or TV recording equipment) and therefore don't need one? I think that's enough from that stupid letter. I'm sure the series will be continued. May be next time with a report from my interview under caution? While I'm very annoyed with these letters I'm beginning to enjoy writing about this perfect example of how not to deal with your customers. And non-customers.